We are not sure who the first occupant of the house was. If Miss Higgins was correct then it could have been the Elizabeth Hawkins who was there in the 1871 Census. John D’Arcy – the 1876 Rate Book provides the earliest record of anyone living in the house. It was John D’Arcy who was living there then. We have a copy of a letter written by John to the Mayor and Corporation and dated 29th November 1875. It shows John was an ‘officer of the excise’. He had been an unofficial tenant in 58 High Street and was asking to be considered as a proper tenant. At the same time he was complaining about the state of that house and asking for repairs to be done. It doesn’t look like John was successful in his application so he went to 15 Pullins Green. Hannah May – the 1880 Rate Book and the 1881 Census shows the house was occupied by Hannah May, a widowed laundress aged 50 born in Thornbury, and Ellen E May, her daughter, a shirtmaker aged 22 born in Bassalleg, Monmouthshire. Hannah was born in Thornbury in 1830, the daughter of John Boulton, a labourer and his wife, Elizabeth. In 1851 she was still living with her parents in Castle Street and working as a laundress, like her mother and her sisters. In 1857 she married Daniel May in Monmouthshire. Daniel worked for a Baronet, Charles Morgan, at Tredegar House in Duffryn. 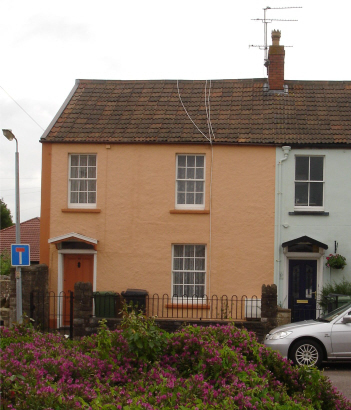 Their daughter, Ellen Elizabeth, was born in 1858 whilst they were living in Bassalleg near Newport. Daniel was working as a groom at this time. Sadly he died in the same year (1858) aged about 27. Henry Randall – the 1890 Rate shows that Harry Randall was living here – but we can’t identify Harry in any of the other records. The Champions – the 1910 Rate Book shows that the house was occupied by Elizabeth Champion. Elizabeth was the widow of William James Champion who was born in Alveston in 1845 and was a farmer in Shellards Lane. William married Elizabeth Sanigar in 1872 and they had at least 3 children: Elizabeth Maud born on 26th July 1880, Emily Winifred born on 28th April 1884 and William Charles born on 22nd November 1887. William died in 1891 aged 45 and by 1901 Elizabeth had moved to Rudgeway where she was working as a dressmaker. ‘Willie’ was living with her, but the two girls were away in service. Maud as a parlour maid for Dr E. M. Grace in Park House in Thornbury and Winifred as a domestic servant for Miss Williams in Weston near Bath. By 1901 Elizabeth had moved to 15 Pullins Green. The 1911 Census shows Elizabeth living in 15 Pullins Green with her children: Winifred aged 26 and William, a mason aged 23. It notes that Elizabeth had had seven children, but three had died. Elizabeth died in April 1915 aged 70. Her obituary printed in the South Gloucestershire Chronicle on 23rd April shows Elizabeth had been invalided for several years prior to her death and that she had formerly been a mistress at Rudgeway School. The report also mentions that she and her husband had lived at Owls Nest, Alveston. We know from locals that Elizabeth’s family continued to live there. In February 1916 William was a painter for Mr Hawkins. He made an application for exemption from military service on the grounds that he had to support his sister who was in ill health and would be unable to earn her living. By May 1916 the application was withdrawn because he had enlisted. The 1918 electoral register shows Emily Winifred living there. William served as a sapper in the Royal Engineers during World War I. 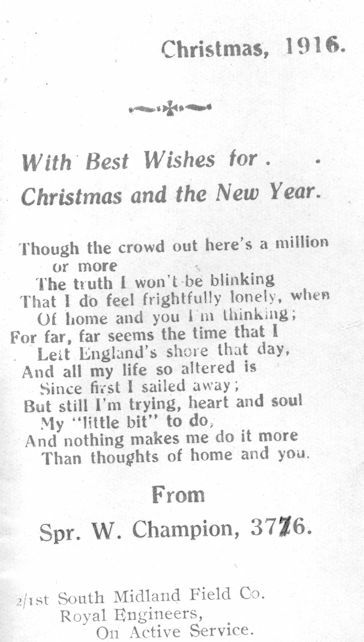 Below on the right we have a thumbnail image of the inside of a Christmas card sent by William Champion to his sister. It seems unlikely that the verse was actually composed by William himself but the card does give his rank, number and regiment. Please click on it for a larger photograph. After the War William became a builder and contractor. As his letterhead shown below says his works were located in Alveston. In 1925 William acquired the whole of Field 222 in Alveston and other fields nearby. He used the land fronting the A38 to build a series of houses (those running from the junction with Forty Acre Lane (opposite St Helens Church) towards the Masons Arms. The houses were sold off as they were built. By 1921 both Emily Winifred and William Charles were listed as living in 15 Pullins Green. By 1927 Emily had become the second wife of Oliver Higgins who was living nearby at number 13 Pullins Green. Emily is shown in the photo on the left. William continued to live at number 15 up until the early 1950’s. The special register compiled in 1939 in preparation for the war show William and his sister, Elizabeth Maud, were living in the house. Both of them were still there in the 1946 and 1950 electoral registers. William died in 1954. On his death in 1954, his remaining property was transferred to William’s sister, Elizabeth Maud and then in 1958 to her niece, Joan Higgins. In the 1954 and 1957 electoral registers Elizabeth Maud was living there on her own. From 1958 the house was bought from Jack Hodges, one of the Trustees of George Hodges by Joan Higgins the niece of William Charles and Elizabeth Maud. Elizabeth Maud died in 1962.
f the sons of Oliver Higgins. He had worked on the railways in his earlier years. He was there in 1965 and 1970 electoral registers. He died in 1980 aged 85 years. It seems that as was the case in some other of Miss Higgin’s properties, 15 Pullins Green was also divided into flats. We have a copy of an agreement between Miss Joan Higgins and a tenant Jack Archibald Mervyn Bowen dated 1st May 1963 that shows that Mr Bowen rented the first floor of 15 Pullins Green but that he had right of access through their joint front door and right of access to the kitchen garden through the kitchen and the back door. In more recent years, Miss Higgins let the house to a number of tenants and following Miss Higgin’s death in 2008 the house was sold by her executors.